Monaco is the second smallest nation in the world, and essentially a city-state. Claimed by the House of Grimaldi back in the late 1200's, and under their control from 1339. Monaco as a nation has 2 flags. A National flag, and a state flag. The state flag is a white banner with the national coat of arms placed at its centre. The coat of arms holds a shield in the centre with the House of Grimaldi colours of red and white arranged in lozenges. Supporting the shield are 2 monks with drawn swords. 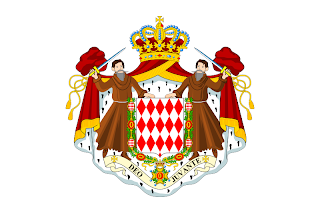 These allude to how the House of Grimaldi took control on Monaco. In 1297, when Francois Grimaldi led a group of soldiers within the city walls, dressed as monks. Surrounding the shield and supporters is a collar representing the Order of St Charles. In 1881, Prince Charles III introduced a simpler national flag. A horizontal bicolour of red, and white. The same as Singapore, but without the stars and crescent. 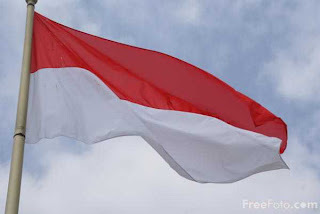 And similar to Poland, and Indonesia. 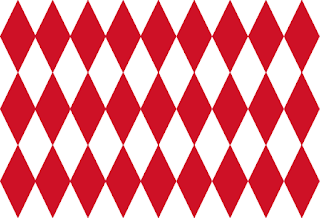 Monaco has a third, unofficial flag. This unofficial flag has been seen, and is quite common. But has no formal role, and represents no Monegasque official. A banner based on the shield of the House of Grimaldi.